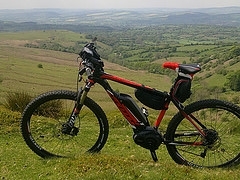 Today (Monday 19th May), I thought I’d really test the Scott E-Aspect 710 MTB, and headed out with the intention of climbing Brown Clee Hill and finding a way across to Clee Hill, and back home. The last time I did this, I was 14….it was on a conventional Townsend “mountain bike”, a 50 mile round trip and took all day. Much quicker and easier this time, even though I’m not as fit as I used to be. I tried to be sensible with the assistance on the Scott E-Aspect 710 MTB knowing it would be tight to make it all on one charge, so I only used it when I really needed it and never went above ‘Tour mode’ on the way to the Hill. This is the base of Brown Clee looking beautiful with Bluebells everywhere: Then about 20 mins later a quick water stop and enjoy the peace and quiet. Looking OK for the return journey so far…. Another 40 mins of climbing some seriously rocky tracks and treacherous fire-breaks through dense woods which needed Sport mode of the Scott E-Aspect 710 MTB as the gearing wasn’t low enough to cope. I don’t do hills like this everyday, so not too bothered about changing out for a higher toothed sprocket. Skirted the peak of Brown Clee by taking a wrong turn as I was doing this all from memory, and I came out at the dip between the 2 peaks – good place to stop for a rest and soak in the scenery looking across towards Wales – think that may be the Long Mynd? Hardest part to come, I needed Sport mode again here as it got very steep and dodgy around the Sheep holes and then I hit the boggy bits. The Scott E-Aspect 710 MTB performed flawlessly and powered me through the water and mud with great confidence, The wide bars gave me brilliant control and I was up the remainder of the hill in no time grinning from ear to ear…really enjoyed it. Got to the top at 26 miles and had one of those moments of dread when I noticed my expected range was now only 7 miles on Eco with 22 miles to go. Remembered I’d just climbed up in Sport mode so knew it wasn’t going to be very accurate until I’d ridden some flat to get a more accurate reading, so set off on my descent unperturbed at break neck speeds, deciding not to head for the peak of Clee Hill in the distance. Finally made it home on Eco/Tour mix with 1 battery light showing and 48.77 miles on the trip…there may be a couple of miles left in it at best, so very pleased to have not run out of juice. 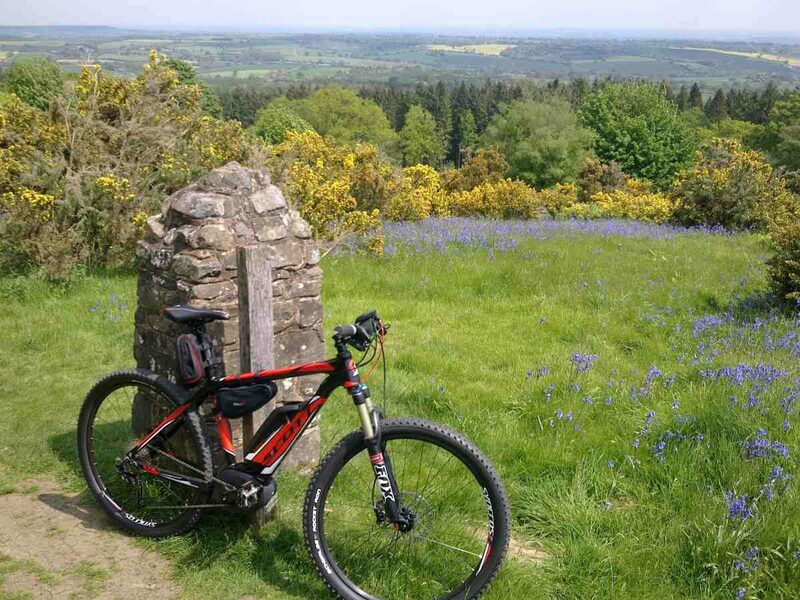 Absolutely loved the Scott E-Aspect 710 MTB…though I will definitely have to fit a stem raiser and possibly a different saddle as my wrists, neck and bum are really sore and I struggled on the last 6 or 7 miles. 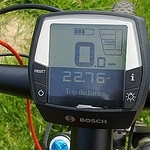 Very impressed with the Bosch Performance on the Scott E-Aspect 710 MTB, though I think Turbo is almost unnecessary as Sport mode was more than enough for every situation, though maybe I need some steeper hills!